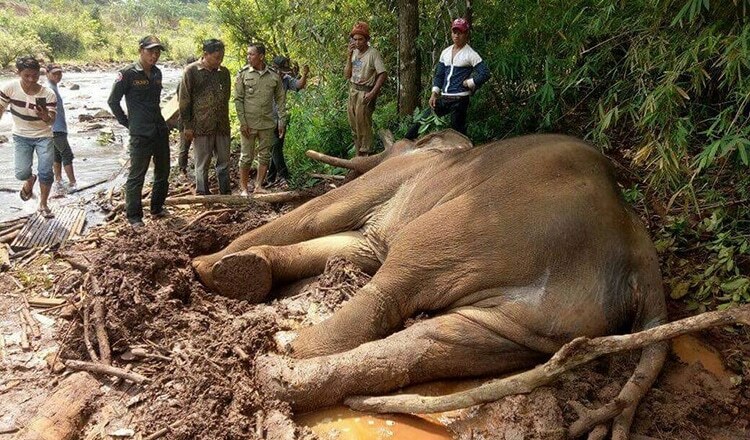 Pictured, Beong Kok- Cambodian elephant starved to death. 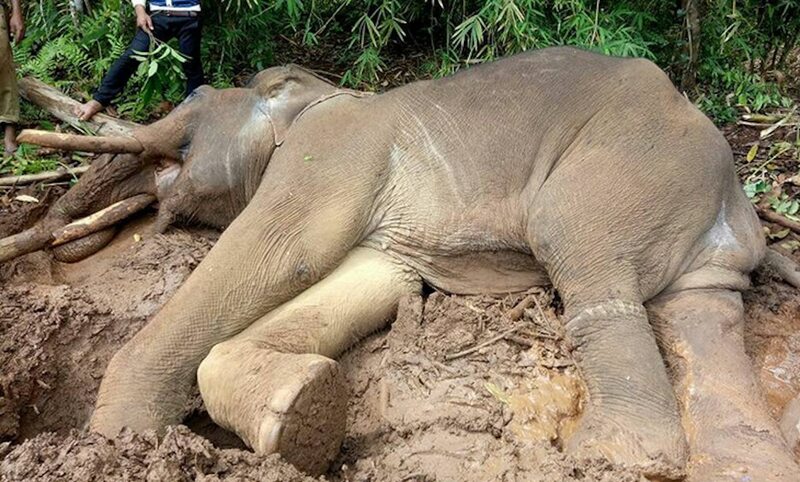 Beong Kok- Cambodian elephant starved to death as punishment for running away. A local elephant is denied food for 30 days, fainting ongoing before being found dead. Local media has told of a 35 year old elephant being starved to death in Cambodia, after its owner refused to feed the animal for a month as punishment for ‘bad behavior’. The animal, named Beong Kok invoked outrage after he ran away and rampaged through a village, damaging houses in Sen Monorom last month. The elephant’s owner caught him two days later, on March 28, and refused to feed him – believing that weakening the elephant would stop the unpredictable behavior. The lack of food led to Beong Kok becoming increasingly frail before finally collapsing on a muddy road after losing the strength to stand on his own reported feet reported the Khmer Times. Wildlife workers found him on Saturday at 9.45am but were unable to save him. He died later that night. Khun Diyon, a director of a local elephant conservation organization who tended to Beong Kok, said the elephant hadn’t injured anyone during his rampage. ‘Weakened by starvation, the elephant had no strength to rise and stand on its own despite making several attempts to rise up,’ he said. He added that Beong Kok had been shot with tranquiliser guns after the rampage last month. The owner believed that withholding food ‘would weaken him’ and prevent aggression. ‘Expert officials could not save him because this elephant had no power and no food to eat. We are sorry to lose the elephant,’ Khun Diyon added. While noting, ‘Generally, the owner keeps his elephant in chains in one place. But the owner must still give it food’. Not clear was whether the form of punishment doled out was a common practice and whether authorities and animal rights groups were aware of the animal cruelty. Local government workers are now investigating the death after tracking down the owner. The population of elephants has been on the decline with about 250 to 500 in Cambodia.